Old, older, oldest … Ron Matusalem 23 Solera Rum will make you dream of the tropics. Ron Matusalem was originally founded in Cuba in 1872. But when the Communistas threatened to confiscate not only the Rum but the means of production, they picked up the entire operation and moved it to the Dominican Republic. Their entire line of premium Rums are molasses-based and all of them are aged by the perpetual Solera method ensuring high quality and consistency across the board. Remember that Solera aging involves only bottling a portion of the oldest casks, and then refilling it from the top with newer spirit. The final cut in the bottle has some very old spirit mixed in. So although Ron Matusalem 23 Solera is indeed 23 years old, that 23 refers to the youngest possible spirit in the bottle. The average age of the Rum is a lot older. But none of that matters. What matters is taste and this fine Caribbean Rum tastes great. It’s smooth and creamy in texture and packs in enough flavor to impress even the most discerning Rum fan. Don't hide it behind blended fruit juice and paper umbrellas. Just don't. 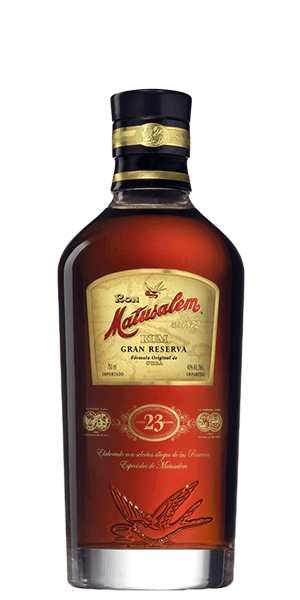 What does Matusalem 23 Gran Reserva taste like? The Flavor Spiral™ shows the most common flavors that you'll taste in Matusalem 23 Gran Reserva and gives you a chance to have a taste of it before actually tasting it. Rich and thick with jammy fruit and creamy texture. Spice jumps in at the finish. Matusalem is a Latinized version of the name Methuselah who — according to the Hebrew Bible — lived to be 969 years old.